Starbucks is embracing AI-powered digital assistants with a new ‘skill’ for Amazon’s Alexa as well as an iOS app that will let customers place an order via voice. The new capabilities are an extension of the company’s existing Mobile and Pay functionality launched back in 2015, which allowed customers to avoid lines at the register by ordering in advance through its mobile app. Anyone with an Amazon Alexa powered device like the Echo smart speaker will now be able to install a dedicated ‘Reorder Skill’, which will let customers place a quick order for their usual Starbucks fix and pick it up from one of the last 10 stores they’ve ordered from. To enable the Starbucks Reorder skill, you'll need to have previously placed a mobile order with the Starbucks app for iPhone or Android. Once you’ve done that you can tell Alexa “Order my Starbucks” to place a quick order or “check my balance” to check your primary Starbucks Card balance. Over on iOS, Starbucks is rolling out voice ordering to a limited group of 1,000 people nationwide and plans to expand availability later this year. The feature relies on artificial intelligence to interact with customers, allowing them to place an order or modify it in the same way they would order coffee at a store. 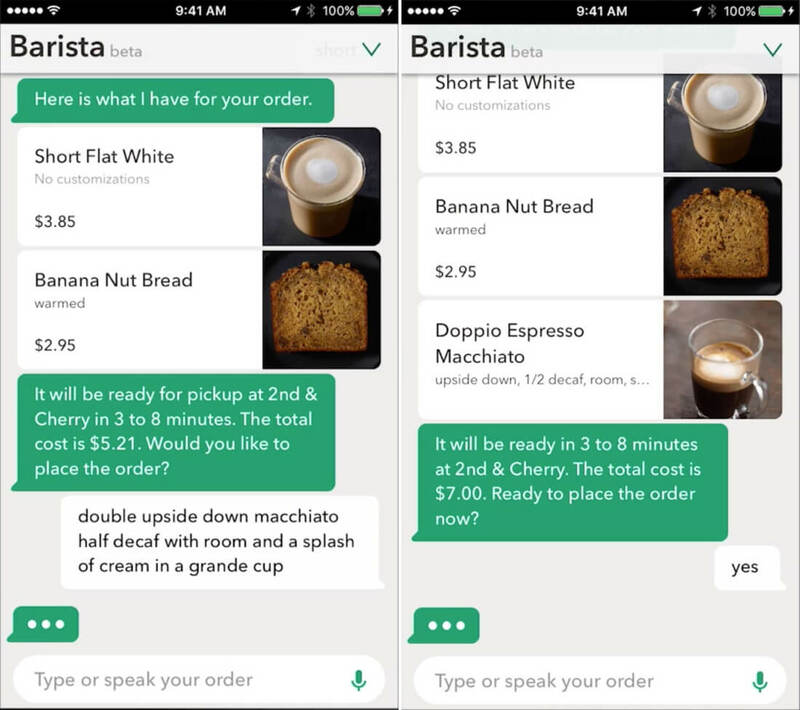 Customers can also interact with the virtual assistant by messaging their order. An Android version is in the works too and will be released later this year. Interestingly, Starbucks says mobile payments now make up 27% of transactions in the U.S., and while that has resulted in less congested lines at registers, it also means more congestion at the handoff.